It's summer concert time!!!! What are you going to wear?! 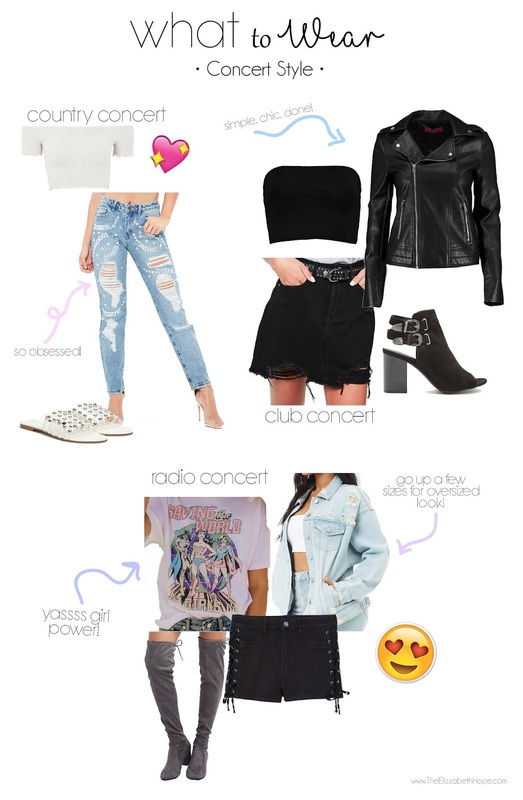 Here is some inspiration of what to wear to a concert! Are you going to any concerts this summer? Let me know below! I really wanted to go to Luke Bryan but I think I'm too late to buy tickets! That and Taylor Swift! Loving country music at the moment! My favorites are Luke Bryan, Lauren Alaina, Thomas Rhett, Kane Brown, and ovi Carrie Underwood! This outfit would be very cute to Taylor Swift too! Just sayin! As in concerts that are in clubs like The House of Blues! I saw Iggy Azalea there my Sophomore year and she was amazing!!! I love going to radio concerts because there are always more than one person preforming! I love going to Kiss Concerts! They are so much fun and always have the best people!